However when you look at the etymology of the word and it’s origins, it is actually based on two german words. “Pumpern” means to break wind and “nickel” means goblin or devil. So together they mean “Devil’s Fart.” Think about that next time you buy a loaf. If interested check out this Snopes article which discusses another widely accepted but not as accurate origin of the word involving Napolean and his horse. Well however it got its name I love pumpernickel. A. Lot. I’d eat it and not give it to my horse. I think I’ll stick with chocolate. On your homepage, with the large main graphic, the adds appear in the middle of (in top of) the picture on my system (Win 7 with Firefox). Sounds like a self fulfilling prophecy! Curious & curioser… I have never tried it & now I’m not sure I want to. So woul;d a devil fart burn like after eating the hottest available chilli? That’s it…I’m switching to rye! I knew there was a reason I didn’t eat pumpernickel! I wonder if there are any other fart breads? Maybe you can make a website for “fartbreads of the world”? I have enough trouble managing THIS page. Left my Rolling Stone review on G+ (rim shot) but just can’t get over how much your rendition of The Dark One cracks me up, Just so damned funny Bearman. Ah, a glass of Andro Vampire wine, a crust of bread and thou,,,, -insert Gothic version of campfire scene from Blazing Saddles-. haha. Love that scene in Blazing Saddles. Classic movie. The bread of life of smells good. The odor left by the devil is often described as sulfur smelling – not so good. Thanks for the word lesson. If I come across a stupid fact I share much like you share smart facts. Hmm…I need to stock up on that stuff. Sometimes it’s fun to clear a house. Love this! I’ll never be able to eat pumpernickel again without thinking of this! So, how do they do it? Bake them first and then spray, or saturate the dough before baking? Yes!!! 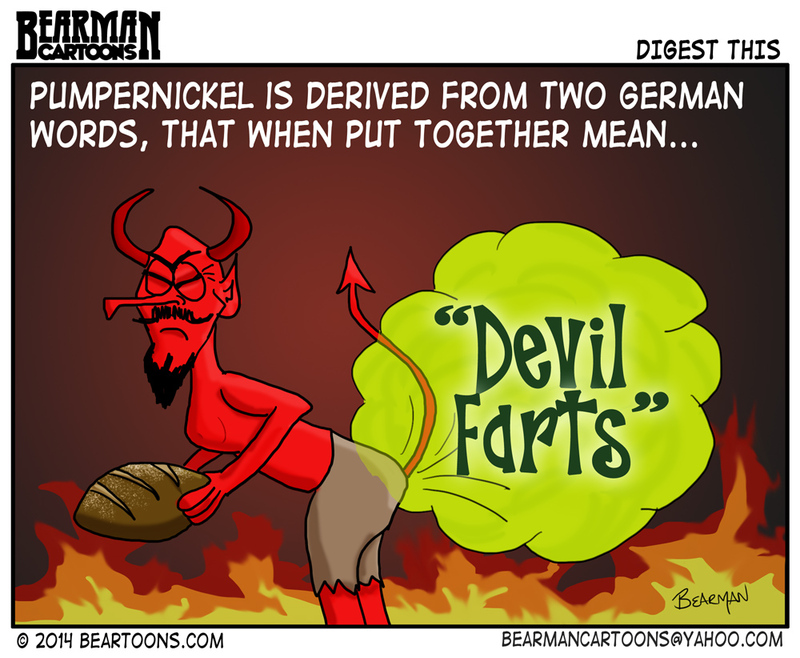 I will have some Devil’s Farts today!!! It’s my favorite bread!!! Well, that explains why I never liked the stuff! I always knew there was something suspicious about a dark bread so delicious. I guess it’s not kosher then. I like when it’s warm, but not when it’s cold. Hmmm… Fresh farts only. I live in Germany and you taught me something I didn’t know. Next time I go to the bakery I’m going to order a Teufels Furz. I don’t know if I’ve ever had pumpernickel. I guess I would know by the smell. That does sound quite appetizing! …Er… Wait. Is there such a thing ever as asbestos underwear?